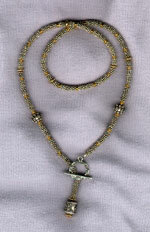 Sterling and 14k gold necklace with Balinese beads and dangle from toggle clasp. 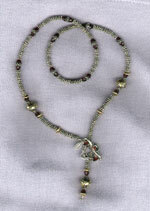 Sterling and cone-shaped garnet necklace with 14k gold accents, gold and sterling Balinese beads, garnet toggle and dangle. 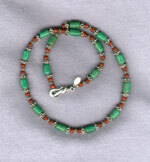 Turquoise and goldstone necklace with sterling accents and hook clasp with safety catch. 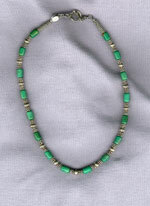 Turquoise and sterling necklace with toggle clasp.